A good way to start the new year. Great stuff. Storing your pyjamas at the hospital for when you're wounded - doesn't get more British. The most important cardboard box ever? Why does the military insist on saluting? 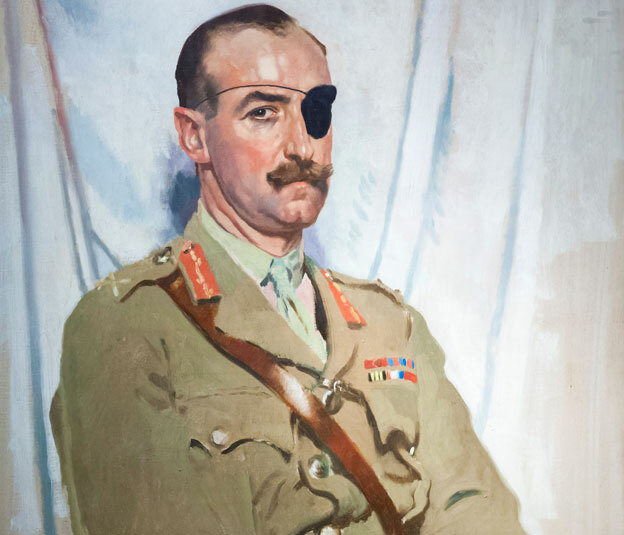 Sir Adrian Carton de Wiart was a one-eyed, one-handed war hero who fought in three major conflicts across six decades, surviving plane crashes and PoW camps. His story is like something out of a Boy's Own comic. Carton de Wiart served in the Boer War, World War One and World War Two. In the process he was shot in the face, losing his left eye, and was also shot through the skull, hip, leg, ankle and ear. In WW1 he was severely wounded on eight occasions and mentioned in despatches six times. Having previously lost an eye and a hand in battle, Carton de Wiart, as commanding officer, was seen by his men pulling the pins of grenades out with his teeth and hurling them with his one good arm during the Battle of the Somme, winning the Victoria Cross. WW1 historian Dr Timothy Bowman believes Carton de Wiart's example helps debunk some myths. "His story serves to remind us that not all British generals of WW1 were 'Chateau Generals' as portrayed in Blackadder. He exhibited heroism of the highest order. "Evelyn Waugh supposedly used Carton de Wiart as the model for his fire-eating fictional creation, Brigadier Ritchie Hook, but Waugh's fictional creation experienced considerably fewer adventures than his real life counterpart." It says much for Carton de Wiart's character that despite being one of the most battle-scarred soldiers in the history of the British Army, he wrote in his autobiography: "Frankly, I had enjoyed the war." He was born into an aristocratic family in Brussels on 5 May 1880. In 1891 he was sent to boarding school in England, going on to study law at Oxford. In 1899 he saw the opportunity to experience his first taste of war. Abandoning his studies, he left for South Africa to serve as a trooper in the British Army during the second Boer War. As he was under military age, wasn't a British subject and didn't have his father's consent, he pretended to be 25 and signed up under a pseudonym. It was a baptism of fire which ended with him receiving bullet wounds to the stomach and groin, necessitating a return to England. Although eager to get back in the mix again, he had to wait more than a decade to experience further front-line action. At the outbreak of WW1 in November 1914, Carton de Wiart, now naturalised as a British subject, was serving with the Somaliland Camel Corps, fighting the forces of the Dervish state. During an attack on an enemy stronghold, he was shot in the arm and in the face, losing his left eye and part of his ear. He received the Distinguished Service Order (DSO) for his exploits. "He didn't check his stride but I think the bullet stung him up as his language was awful. The doctor could do nothing for his eye, but we had to keep him with us. He must have been in agony." "I honestly believe that he regarded the loss of an eye as a blessing as it allowed him to get out of Somaliland to Europe where he thought the real action was." He returned to England to recover in a nursing home in Park Lane. He was to return to this same place on each subsequent occasion he was injured. This became such a regular occurrence that they kept his own pyjamas ready for his next visit. While recuperating from these injuries, Carton de Wiart received a glass eye. It caused him such discomfort that he allegedly threw it from a taxi and instead acquired a black eye patch. Such setbacks were not to delay him long. He soon realised his ambition to fight on the Western Front when he was sent to Ypres in May 1915. During the Second Battle of Ypres, the Germans launched an artillery barrage in which Carton de Wiart's left hand was shattered. According to his autobiography, Happy Odyssey, he tore off two fingers when the doctor refused to amputate them. His hand was removed by a surgeon later that year. The way he overcame injury and disability remains an inspiration, says Colour Sgt Thomas O'Donnell, who served in Afghanistan with the 1st Battalion Scots Guards. "For him to have endured all those injuries and gone through so much rehabilitation in so many conflicts and to never give up is really inspirational, particularly given the inferior medical facilities they had then. I just don't know how he managed it. "Soldiers like Carton de Wiart are a real example for troops serving today. It's quite sad that having sacrificed so much his story isn't particularly well-known. I think as well as remembering the war dead, it is vital we remember what injured soldiers like him went through in countless conflicts." O'Donnell knows from first-hand experience what it is like for a soldier to have to battle back from severe injury. He was wounded in Afghanistan in 2010, when a sniper's bullet hit him just above his left kneecap, smashing the knee in two. He was told he might lose his leg and that his soldiering days were over. But a desire to walk his daughter down the aisle unaided and to serve with his battalion again saw him defy medical advice and return to front-line action in Afghanistan in September 2012. O'Donnell is self-effacing about his own experience. "I want to make it clear that I went through nothing like as much as he endured. Carton de Wiart is like Robocop." A soldier who served under Sir Adrian Carton de Wiart at the Battle of the Somme recounts his experiences. So if Carton de Wiart was a serving soldier today, would he be allowed to return to the front line having lost an eye and a hand? O'Donnell says he would have to undergo stringent tests and strict rehabilitation before a return to front-line action would be considered. "The Army have set a series of tests for injured soldiers that impose a required standard we have to meet to be able to do our job. Myself and a friend of mine, who had lost a leg, completed those tests and were able to redeploy to Afghanistan after several years of rehabilitation. The tests included passing an annual shoot and marching a distance with a certain weight. I would like to think that if Carton de Wiart could still do his job, they would let him crack on." After a period of recovery, Carton de Wiart once more managed to convince a medical board he was fit for battle. In 1916, he took command of the 8th Battalion, Gloucestershire Regiment, and while commanding them at the Somme his legend was cemented. He electrified his men. The eye patch, empty sleeve and striking moustache, combined with his bravery, made him famous, with men under his command describing his presence as helping to alleviate their fear before going over the top. During fierce fighting, the battle for the village of La Boiselle swayed back and forth. When three other commanding officers were killed, Carton de Wiart took charge of all units fighting in the village and led from the front, holding off enemy counterattacks. He received the Victoria Cross, the highest British military award for gallantry, for his actions at La Boiselle. He, however, declined to even mention the medal in his autobiography, later telling a friend that "it had been won by the 8th Glosters, for every man has done as much as I have". He took part in a number of other offensives during the war, picking up more injuries. Mr A Holmes, who served as Carton de Wiart's "batman" or personal servant, told the 1964 BBC Home Service programme, In Our Time, how his commanding officer had a particularly lucky escape during another Somme offensive. "They shifted us from Ypres then back on the Somme again to the Devil's Wood, and that's where the old man got shot through the back of the head. But fortunately it missed his spinal cord." Some historians have contended that Carton de Wiart's bravery at times bordered on recklessness, and that this may have explained his being passed over for promotion to divisional command in WW1. But Bowman believes there were mitigating factors. "He was a brave soldier and effective leader of men. He was well qualified to hold divisional command, but so were many others, and his habit of turning up in the front line and getting himself injured didn't bode well for his ability to manage a division. "Given the primitive communications of the time, and the amount of bureaucracy involved, commanding a division in WW1 did involve a lot of office time, which didn't seem to be his forte." Carton de Wiart lived in Poland for most of the inter-war period but his military career was not yet over. When World War Two broke out, he led a campaign in Norway in 1940 and was briefly stationed in Northern Ireland. "Governments may think and say as they like, but force cannot be eliminated, and it is the only real and unanswerable power. We are told that the pen is mightier than the sword, but I know which of these weapons I would choose"
"Frankly, I enjoyed the war [World War One]"
"At that moment, I knew once and for all that war was in my blood. If the British didn't fancy me, I would offer myself to the Boers"
In April 1941 he was dispatched to form a British military mission in Yugoslavia, but his aircraft was shot down over the Mediterranean. After swimming to shore, he was captured by the Italians. Despite being in his 60s, he made numerous attempts to escape the PoW camp, on one occasion eluding recapture for eight days - quite a feat given his distinctive appearance and lack of Italian. He was eventually released over two years later and was then sent to China by Winston Churchill to be his personal representative to Nationalist leader Chiang Kai-shek, a post he held until 1946. Churchill was a firm admirer of Carton de Wiart, describing him as "a model of chivalry and honour" and writing the foreword to his autobiography. In retirement, he eventually settled in County Cork, spending his time fishing. Having proved indestructible on the battlefield, he died peacefully in 1963, aged 83. Military historian Lt Col James Cook, of the Royal Artillery, believes his example continues to resonate today. "Carton de Wiart did have a habit of getting injured but this is simply testament to his belief of leading from the front. He inspired his men with the simple and eternal words, 'follow me'. These words remain the mark of a truly courageous leader, be it on the Western Front a hundred years ago, or today in military operations around the world." Carton De Wiart was awarded the Victoria Cross for actions at La Boiselle. The Times newspaper carried the following notice on September 11, 1916. "For the most conspicuous bravery, coolness and determination during severe operations of a prolonged nature. It was owing in a great measure to his dauntless courage and inspiring example that a serious reverse was averted. He displayed the utmost energy and courage in forcing our attack home. After three other battalion commanders had become casualties, he controlled their commands, and ensured that the ground won was maintained at all costs. He frequently exposed himself in the organization of positions and of supplies, passing unflinchingly through fire barrage of the most intense nature. His gallantry was inspiring to all." He bit off his fingers. Yum !